1. Casing shall be manufactured with double male threaded ends using a round thread on a thread pattern of 6 threads per inch on a 2 degree taper with 5 inches of threads. A fiberglass coupling, incorporating the exact same thread pattern as the pipe, shall be factory bonded on one end of the casing to within 1/4 inch of the middle of the coupling. 2. Threaded joint shall be rated at maximum tensile strength according to wall thickness from tensile ratings chart and all joints must be pinned when total weight of casing string exceeds maximum rating. 3. Casing shall be manufactured in 20 foot lengths. 5 foot and 10 foot joints shall be manufactured by special order. Make-up in each threaded joint may vary by 1/4 inch. 4. 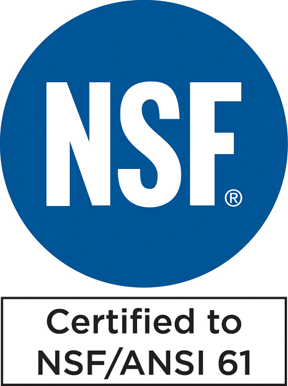 Casing shall be tested and Certified to NSF/ANSI Standard 61 and labeled with the NSF mark on each joint. 5. Casing classification under ASTM D2996 is Type 1, Grade 2, Class A. This means casing shall be non-lined in standard product line. 6. Sand impregnated casing joint is recommended for use in cement grouted wells when borehole exceeds casing setting depth. 7. Casing and joint shall be rated at maximum internal pressure rating according to wall thickness from internal pressure ratings chart. 8. When joints are not bonded together, during installation process, all joints must be taped with not less than 2 mils of Teflon tape and caulked with a Teflon based pipe dope to meet required values on joint. 9. All casing, 12 inch I.D. in diameter and larger, used in a cement grout application, shall be reinforced during manufacture by an outside corrugation of fiberglass that will substantially increase resistance to collapse. 10. All casing, used in a cement grout application, shall have the bottom 2 joints pinned at the coupling with 4 – 3/16” screws to eliminate the possibility of a joint unscrewing during under reaming by the drill bit. The pins should be of proper length to ensure they do not protrude through the inner wall of the casing causing internal damage to the casing. 11. Minimum wall thickness, of standard casing over 6.5″ I.D., shall be .240″ +- .020″. All casing, to be cement grouted in a borehole, shall have a specific wall thickness along with outside fiberglass corrugations configured in accordance to Burgess Well Company specifications, according to depth of application and diameter of casing. 12. Maximum depth setting of all diameters of casing shall meet manufacturers setting recommendations. 13. All fittings, adapters and flanges, used in conjunction with Burgess fiberglass products, must conform with Burgess thread pattern, wall thickness and resin base to comply with manufacturers specifications. 14. All casing shall have an approximate ratio of 70% fiberglass to 30% resin by weight +- 5% as according to standard filament winding technology. 15. Angle (helix) of fiberglass to mandrel shall be 53 degrees +- 2 degrees during manufacture of casing according to standard filament winding technology. 16. Casing shall be sand coated for additional adhesion of cement grout as per Engineer’s specifications. 17. When casing joints are bonded together using a permanent bonding agent, guidelines from Burgess publication titled “Permanent Bonding of Burgess Fiberglass ASR Well Casing Installation and Procedure” must be strictly followed to ensure proper installation of casing and to comply with pressure rating requirements for warranty purposes. All specifications and properties specified above are approximate. Specifications and properties of material delivered may vary slightly from those given above. Burgess Well Company makes no representations of fact regarding the material except those specified above. Final determination of the suitability of the material for the use contemplated is the sole responsibility of the Buyer. Burgess Well Company representatives will assist in developing procedures to fit individual requirements.